Photo courtesy of Grahm M. Balkany and Ruth Saringe. Found in Chinatown in Chicago. Non-violators will be scattered showers with wind gusts. We assure the most delightful and pleasurable punishment for the violators. I was loss, but now I’m fine. Ground into extremely small particles? Wow, harsh punishment! But trespassers will be violated. Girl, you so fine, you can throw garbage in my yard anytime. People who don’t litter on the other hand will contract a nasty disease and die a horrible death. Just keep it clean, violators. … if they survive the freezing process, that is. Chicken feet asked for peaceful solution. This young lady woke up to find she had turned a purplish pink colour. The Justice Department weather report: FINE TODAY COOLER TOMORROW. Actually, it is fine by us if you violate anyone under this sign. There are no violaters in Chicago, Trust me! Oh Mickey, you’re so fine, you really violate my mind, hey Mickey! Hey Mickey! 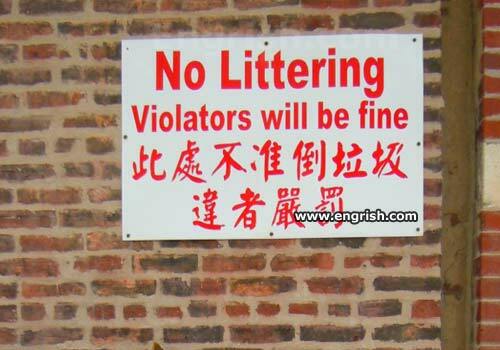 “no littering; non-violaters must be fine”? It’s a messy but mellow place. It’s meant to tell you nicely not to litter but if you insist on littering you’ll leave us no choice but to tell you nicely again. Great . . . moreover, Finers will be violated. Is this why there’s so many Chinese people around?